First Draft is good. It's a Manchester-based cabaret event, with people performing music, poetry, stories, comic monologues and short plays on the same stage. Great idea that. One format nights are all very well, but for those audience members with shorter attention spans (hand going up) changing up the kind of work being performed can really help keep things engaging. 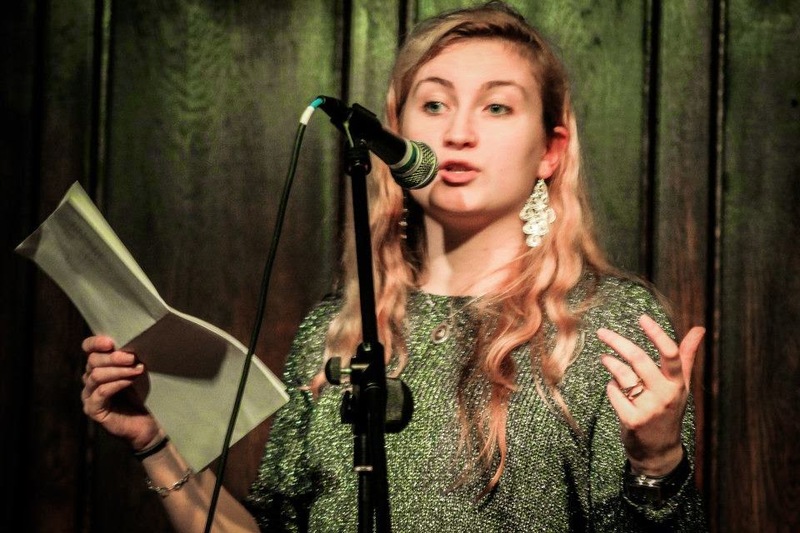 Your brain does sometimes start to wander a bit after the fifth flash fictioneer takes the stage, or the seventh slam poet, no matter how fantastic they might individually be, and that's only natural. The idea is that this really is the first place to perform stuff that's still very fresh, so there's an off-the-cuff, low-risk feeling about it that can be quite freeing. The organisers (including the lovely Abi Hynes, above) work very hard putting the regular night together, and they really took on a big project with last month's Next Draft: a two-day event at the King's Arms produced with Studio Salford, aimed at giving past performers a chance to perform works that were a bit further along in its development. I went along and enjoyed Jez Hewes and Andrew Williamson's daft mashup of three songs, a lovely nonfiction essay from Nija Dalal, a funny performance from Anjali Shah, a cheesy story from Fat Roland and Faro Productions' one-woman play about the fascinating Mata Hari. Unfortunately I had to leave before the second half so missed out on Papermash Theatre’s Happy Birthday Without You, from playwright and performer Sonia Jalaly. But they're back to their bi-monthly-ish slot at The Castle next Monday night with a fresh batch of performers ready to rise to the Empyrean heights of the challenge set by the theme 'Songs of Praise.' Come along, or get in touch if you're interested in performing here, the next one's in August.